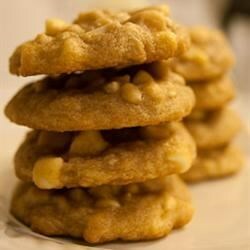 "Drop cookies with macadamia nuts and chocolate chips!" Preheat oven to 375 degrees F (190 degrees C). Lightly grease 2 large cookie sheets with vegetable shortening. Cream the butter and sugars together in a large bowl. Beat in the egg and vanilla extract until well blended. Sift together the flour, baking soda, and salt; gradually blend into the batter. Stir in the chopped macadamia nuts and chocolate chips. Drop by rounded teaspoonfuls onto the cookie sheets, about 2 inches apart. Bake in preheated oven for 10 to 12 minutes, or until the cookies are golden brown. Remove from the oven, and transfer the cookies to cooling racks. See how to make an amazing cookie with nuts and white chocolate. These cookies turned out GREAT! The only thing I changed was that I used 1/2 teaspoon of vanilla and 1/2 teaspoon of almond extract. Very good! I substituted the chocolate chips for white chocolate chips. Great recipe! I used milk chocolate chips and tried the 1/2 tsp. of almond extract & 1/2 tsp of vanilla extract as someone suggested and they turned out delicious! A must try recipe!